The Lord of this kshetram is known under the name "Palli Konda perumal". He poses as Lord Ranganatha with four hands. In a way of explaining the Unison of Lord Shiva and Vishnu, Lord Vishnu has adopted many qualities of Lord Shiva such as dancing (Kuravai Koothu at Thiru Arimeya Vinnagaram), Accepting Lord Chandra as a head ornament in Thirushankadu etc, he transforms this place as his stage for dancing as Lord Shiva took Chidambaram as his dance stage, and stys still as Ranganatha respresenting stableness Shivalogam. When Lord Narayana took the Dasawatarams, the dance which was danced by the Lord after killing Hiranya as Narashima lots of kings as Lord Parasurama is called as "Shankara Thandavam". Lord Krishna dance with the Rishi's who were born as Gopikas in Gokulam is "Aanandha Thandavam" Lord's special dance "Koda Koothu" in Thiru Arimeya vinnagram is a splendity. The actions of Lord Varadharaja, while testing the devotees and giving warmth to his devotees while giving boons and showing Vishnupadham using his hands are known as "Anavaradha thandavam" the dance of Lord Krishna on the top of the Banyan leaf as an infant kicking and curling, sucking his toes, in the period of Pralaya is known as "Pralaya Thandavam". As Lord Shiva showed his dances to Sivakami Parashakthi, viyakrapadhar, Padanjali, Paanini and Nandhi deva, Lord Vishnu too has showed glimpses of his dances to piratti Naachiyar (wife of Lord vishnu), Aadhi Shesha Anathalwan and the heards of cows too got dharsan of his Yoga naya dance while he was Lord Krishna at Gokulam. Here the perumal is in sleeping posture. Here we may take that either he lying down before dancing or taking rest after dancing. Though the Lord is in sleeping posture his eyes would be wide all the times. The perumal at this place is known as Shenkann Maal for he has reddish eyes. The eye's would have become red after performing a very tough dance or would have become red as he never closes his eyes even while sleeping. In order to inform people tht the ideal person explained in the Vedas is noneother than himself, the vimaanam is named as Vedha Vimaanam. Though the Lord is in sleeping posture, he is guarding his devotees using Yoga Maya and is seeing the happenings of the world through his sun like eyes. So the Pushkarani is named as Surya Pushkarani (Suryan means Sun). Direction and Posture Bhujanga Shayanam and East-faced posture. Access to the temple Lies west of Thirunangoor Prakara. 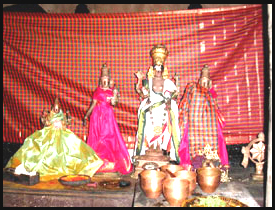 The Moolavar of this Divyadesam is Sri Senganmaal Ranganathar. Also known as Lakshmi Rangar. He is giving his seva Kidantha (Sleeping) Thirukkolam in Bhujanga sayanam facing his thirumugham towards east direction. He is found with Four hands on the Aadhiseshan. Prathyaksham for Naachiyar and Aadhisheshan. 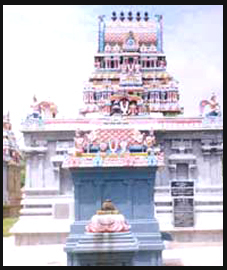 The temple is located in Thirunaangur, 5 miles from Sirgazhi.